Looking for more tours? Local Tour Operators offer the following tours: (Please contact our Front office or email elena@puertobarillas.com for booking a tour). Discover the majestic volcanoes of El Salvador! 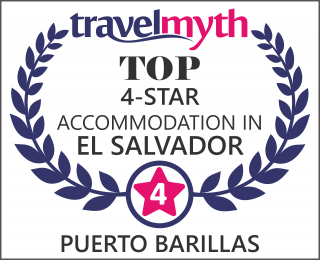 Would you like to visit one of the most distinctive natural attributes of El Salvador? You must visit the volcanoes and lakes of El Salvador. In the lakes and volcanoes tour you will take a sightseeing tour to “Izalco Volcano”, best known as the Lighthouse of the Pacific because the boats were oriented with the red glow of the lava to reach the Acajutla port. Cerro Verde is an inactive volcano located at an altitude of 2035 meters and length of 500 hectares the nature reserve of Cerro Verde, It has a cloud forest in and around the crater with a temperature of between 12 and 18 degrees centigrade. Ilamatepec Volcano or Volcán de Santa Ana, is one of the most beautiful walks you can do in El Salvador. It is a place where you will be surrounded by the wilderness or “dwarf forest”, where you can find pasture and some low-lying bushes, giant agaves, among others. The landscape is unique in Mesoamerica. Next, visit to the volcanic lake “Coatepeque”, cataloged amongst the most beautiful of the world where you can enjoy a boat ride. Welcome to the Land of the Volcanoes. Looking to combine history, culture and nature? The Suchitoto day tour is a beautiful visit to the enchanting city of Suchitoto, also known as the “Place of Flower Bird” for its name in Nahuatl. Suchitoto offers an essence of ancient city with colonial architecture that seems like the time has stopped. Visit its beautiful cobbled streets, art galleries, crafts and home of one of the main attractions of the city for its structure and historical importance: the Santa Lucia Church, built in 1853. The founding of Suchitoto is attributed to the Pipiles, who settled in the present Salvadoran territory of Cuscatlán halfway through the 11 th century and were one of the most veteran indigenous tribes that fought against the Spanish conquistadors in the beginning of the 17 th century. The city is known as the “Cradle of History and Culture” for all the wealth it contains. Later, if you feel like, you can also visit Suchitlán Lake, the largest artificial lake surface water in the country. Its natural scenic beauty makes it an ideal destination to enjoy a artisan boat ride with one of the local boaters. During the boat ride you will be able to visit the different islands that surround the lake, home of migratory birds and native animals. Do you want to discover a city with enchantment? This is the perfect tour to escape of your routine. Do you want to discover the city of San Salvador? This is definitly your tour. Visit the main avenues and monuments of San Salvador, the primary residential zones of the Capital City, the Historical Centre with is majestic Metropolitan Cathedral, beautiful National Palace and charateristic National Theatre of a French Renaissance style declared a national monument in 1979. Then, visit El Rosario Church and Plaza Libertad. In the afternoon, visit San Salvador´s Volcano at only 25 kms from the city. This Volcano is also known as “El Boquerón”. Here, enjoy a refreshing eco walk through the natural trails and a panoramic view to the crater with its particular “volcancito” or “little volcano” inside. The sightseeings are just Impressive! When returning, you will be able to see the beautiful city of San Salvador in the late afternoon. At the end, delight yourself with a warm and tasting cup of coffee or a delicious typical early dinner at a local restaurant in the area, where you will also be able to taste the famous salvadorean dishes: “Las Pupusas”. This tour is a real natural, cultural and historic apporach that characterizes El Salvador.